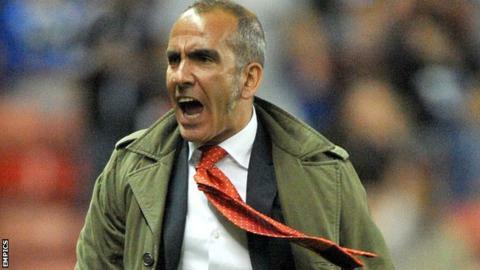 Manager Paolo Di Canio has revealed Swindon are under a transfer embargo. The Italian told BBC Wiltshire after Saturday's 1-0 win over Bury the embargo had been sanctioned because they had overspent on wages and fees. Financial Fair Play rules state League One clubs must limit their wage and fee bill to 65% of their turnover. They exceeded this restriction after a tribunal demanded they pay a combined fee of £340,000 for James Collins and Troy Archibald-Henville. Striker Collins arrived from Shrewsbury in the summer while defender Archibald-Henville signed from Exeter, but Swindon were not expecting to have to pay the settlement immediately. Chairman Jeremy Wray explained: "If they had been straight-forward transfers then half of it would have been payable this year and the other half would have been payable in 12-months' time. "As a result of the tribunal the whole amount is due now, so it's reflected in our wage cap and it takes us around 1.5% over the threshold. "If it was during the transfer window we could sell players but we can't. The board now need to work out how we deal with this." Di Canio says he has been left frustrated by the embargo as he feels it will hinder their ambition of securing back-to-back promotions. "I hope in the future we have a different situation otherwise things will be very difficult," he said. "I remain the same Paolo Di Canio; the chairman remains exactly the same. We all want to push to go up. "But when you get two or three injuries it's very difficult. "I worry that the plan I had 16 months ago has changed. If we want the team to go up we have to cancel the embargo." Despite Di Canio's concerns, Wray insisted: "I don't think it's a situation where fans need to be panicked. "We all know how honest Paolo likes to be. Andy Williams has been added to his injury list and he's looking around thinking if he wants to succeed at this level he'll need reinforcements. "Rest assured this isn't a situation where he is getting annoyed or upset with the board."